Excessive sweating of feet is an unpleasant and underestimated form of hyperhidrosis. Constantly wet and sweat-soaked feet lead to many unpleasant situations. For example, these are usually sweaty socks and sometimes even shoes. The effect of sweat at this closed space opens the way to the spread of many species of bacteria, and what is worse, bacterial decomposition creates a very unpleasant odor." And it is not just the smell that accompanies the individuals affected by excessive sweating of feet. The bacterial activity on constantly wet skin results in skin irritation and different kinds of skin fungal infections, for the treatment of which people pay lots of money worldwide. In addition, this money solves only the cause and not the effect of creation of skin fungi (mycosis), which is constantly wet and irritated skin. In cooperation with the Czech company Hightech Development, we are the first to bring a simple and elegant solution to excessive sweating of feet on the market. For more information, see the following article. 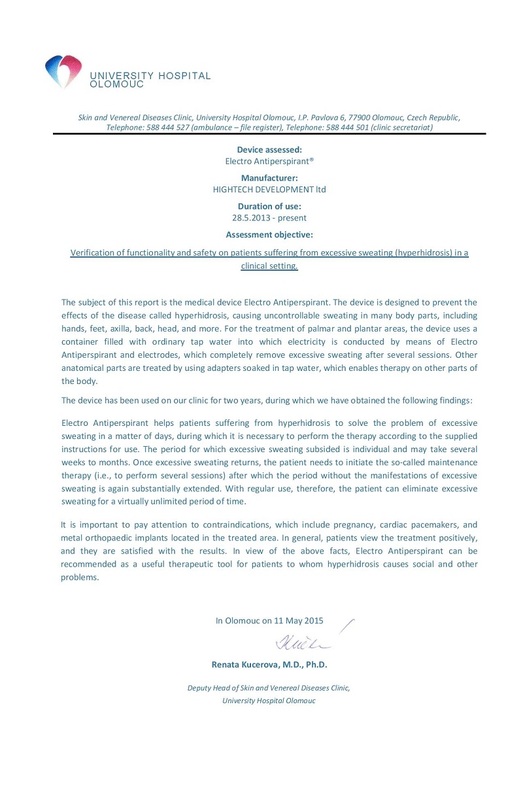 The removal of excessive sweating of feet by means of iontophoresis? It has never been easier! 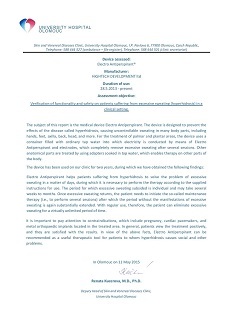 In order to help to understand the process of the treatment of the iontophoresis technology itself, it is recommended to read the article What Is Iontophoresis. Iontophoresis devices are designed so that the medical procedure is applied to the area of feet by immersing them in containers with water while the device is performing iontophoresis for 15 minutes. After completion of the procedure and turning off the device, the polarity is reversed and the procedure repeated in the same manner and for the same period of time. A total of 30 minutes is enough to make you happy. As in most cases feet sweat up to the ankles, it is good to use larger containers than for the application of iontophoresis to palms. You can either buy these together with the device or you can use other suitable containers. The minimum size of such containers should be 32 (length) x20 (height) x16 (width) centimeters. Initially, iontophoresis Electro Antiperspirant is applied in this way 10 times within one month, according to provided Instructions for Use. During this "startup" period, sweating stops completely. When this occurs, simply stop the treatment and resume it only when you feel sweating slowly returns. In this case, the medical procedure is applied only once, maximally twice, and after that you will have peace again for a long time. Normally, the time after which the iontophoresis device must be applied again ranges from 14 to 40 days, which period is called the "maintenance phase". This means that after the initial phase of the treatment, in order to eliminate excessive sweating, all you have to do is to apply the device for 30 minutes once in 14-40 days.